Overweight dog learn more about this issue. do to solve this problem. 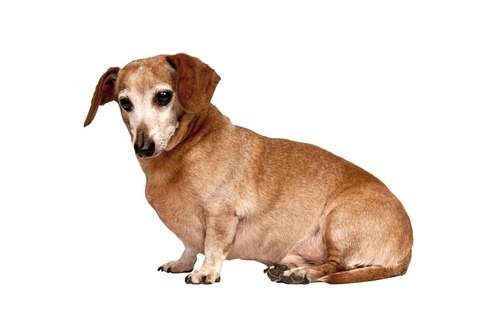 Your overweight dog is at risk of becoming obese this is a condition where your dog is grossly over weight and is one of the greatest health risks for many dog breeds particular the dachshund and seems to be on the rise. This condition has a major effect on your dachshund’s health and well being. Although dachshund’s spinal problems are mostly genetic, excess weight puts more strain on the spine especially with this little dog’s long back. As dachshund dogs seem to put weight on easily, you have to work at avoiding this problem. How do you tell if you have an overweight dog? You should be able to feel your dogs ribs, although they should be well covered you need to be able to feel each rib, if you cannot,your dog is overweight. Also you should be able to see a definite waist line, the area behind the ribs should be narrower than the chest. If you have a long haired dachshund it is easier to see when your dog is wet, perhaps after a bath. If you think your dachshund is overweight have him/her checked by your vet to ensure they are fit and well before starting any weight reduction. Your vet may suggest a suitable diet, to control your dog’s weight. Obesity is often a problem for older dogs, when they become not so active. Many dogs seem to think they need more food than is necessary, so they always appear hungry, if you try to satisfy them you finish up over feeding them. Dachshunds are particular bad for this as they really love their food and yours too. Steps to help prevent obesity. Make sure you have a good exercise program for your dog, long walks, active games etc. Refrain from giving your dog people treats and food from your table, if family members do this it is often hard to follow exactly how much food your dog is getting. Weigh your dog from time to time to keep a check on any regular weight gain. Feed high quality food, and reduce amount if your dog starts gaining weight. Keep dog treats for special times not regularly and get low fat varieties. Sometimes it may be sufficient to reduce the amount of food you are giving your overweight dog, other wise there are commercial weight reduction foods available, these have the advantage of being specially formulated to provide good nutritional value with correct amounts of vitamins and minerals per meal. Health conditions resulting from obesity include – high blood pressure, heart disease, joint problems, kidney and liver disease, diabetes and it also puts your dog at risk during surgery. Be aware of your dogs breed, age and activity level and feed the amount of food that maintains your dogs weight. Preventing your dachshund becoming an overweight dog needs to start early by encouraging good eating habits with your dachshund, start as you mean to go on. Here is a useful tool for working out how many calories your dachshund needs per day and also how many cups of dog food required.